The Nu Groove is a gifted, versatile and charismatic R&B (Motown) band from Connecticut. The band has captured audiences from all around the East Coast and has taken live entertainment to another level. The musical skills of this group specialize in R&B from the 60’s to current and expand to other genres, such as classic rock, jazz, reggae, funk and others. The sound they generate is both powerful and detailed. The band engages with the audience and gets everyone into the music quickly. Their approach leads to an upbeat, party atmosphere where everyone enjoys themselves. Each individual in the band has performed with National Recording Artists. 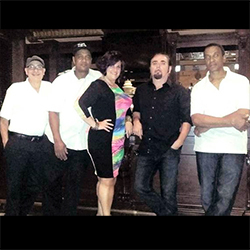 The band features female vocalist Carla Gemma Caccavale, who will get you up and dancing all night long. You can be sure that you are dealing with people who demonstrate a high degree of professionalism in what they do and who have a passion for music!